San Antonio Hotel's Location is Near the RiverwalkLooking for the perfect spot to launch an expedition in San Antonio? 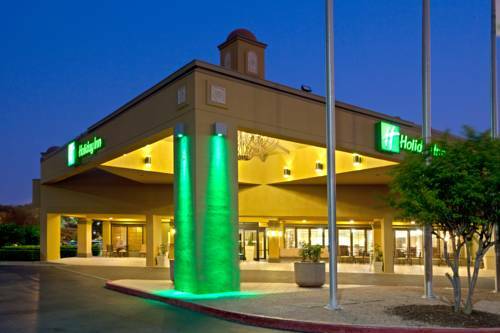 The Holiday Inn San Antonio DWTN (Market SQ) hotel is not only just off of I-35 & I-10, it's also right in the heart of the city. Starting here by foot, bus or car, all of San Antonio is at your fingertips!Travelers searching for fun love exploring the history and modern culture that mix freely in San Antonio. The hotel's proximity to Market Square provides a small glimpse of our traditional Mexican heritage and flair, and the stately elegance of Victorian mansions in the King William Historic District is just a beautiful, shaded stroll away. The hotel's location is also near the Riverwalk, a must-see waterway that links all of San Antonio's major attractions together.Those in San Antonio for business find our hotel only a few blocks from the Henry B. Gonzalez Convention Center, while Lackland AFB, Fort Sam Houston and the University of Texas-San Antonio downtown campus are also located nearby. We offer free Wi-Fi access to keep you connected.Our hotel's location near Market Square makes it easy to discover the unique melting pot of history and beauty in the city. We have a full-service restaurant and lounge that can satisfy your cravings, and the whirlpool and Fitness Center help you relax at the end of a long day. Make your reservation today, and come experience the heart of San Antonio from our hotel! Designed by nationally recognized golf course designer Keith Foster, The Quarry is recognized around the country for it's unique setting and design. At the Quarry Golf Course in San Antonio you will be challenged and rewarded in many ways.